Hey everybody, Happy -belated- Halloween! I didn't get a chance to post this Fish Curry I made last evening. It was a very busy day, with my kids gone trick or treating and then coming home with friends for dinner. Since it was cold and it was raining the whole day, I thought that it was a good idea to have a pot of curry ready for them. I also prepare some plantain chips, that I have posted yesterday and some fried pappadums too! In a large heavy pot, heat the oil and fry the mustard and fenugreek seeds until aromatic. Then add the shallots, ginger, curry leaves and green chillies. Stir until the shallots turn light brown, about 5 minutes. Add the aniseed, coriander, turmeric, cumin and chili powder. Cook for 5 minutes until the curry mixtures are combined and aromatic. Add in the tamarind water and cook for another 5 minutes. Then add the coconut milk and water. Bring it to a boil. Then let it simmer further. Meanwhile, saute the eggplants until they are lightly brown. Then, coat the fish with some turmeric powder and pan fry them. Add the tomatoes, okras, eggplants and then the fish. Then cook for another 15 minutes. Here is the end result of the Fish Curry! I serve the fish curry with steam Basmati rice and with some fried plantains and pappadums! 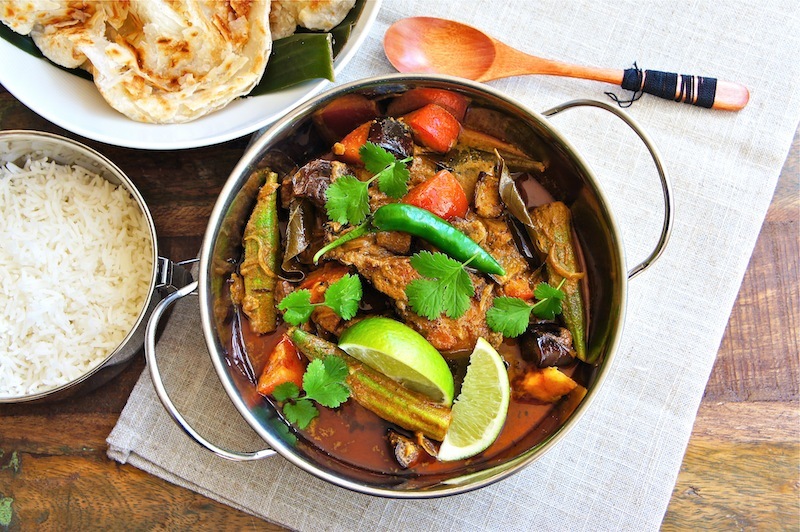 Oh, how I love curries...good job, this looks great! Greetings from Robert-Gilles in Shizuoka, Japan! Now, this is a great way to inroduce a recipe! The pics make it so easy to understand! Curries are so much better cooked at home!